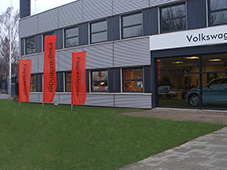 Facade banner is mounted using alu-rails in top/bottom. 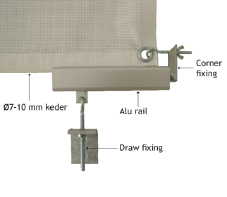 Banner should be equipped with a Ø7-10mm keder in top/bottom and eyelets in corners. The banner is kept stretched with a corner fixing in each corner. Draw fixings are slided into the lower rail and mounted onto the wall with screws. 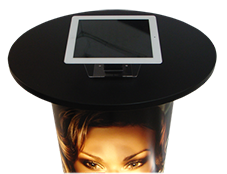 Flex ”curved” display catches the eye and can be used in shops as well as on tradeshows. It can be used free-standing or placed up against a wall. When placed up against a wall, an extra storage place is created as a bonus. A complete system weighs only 2 kg and can easily fit in a carry bag of L: 135cm x H: 20cm. We would like to Introduce our new Flex-display™ MAGNUM system. With the Flex-display™ MAGNUM you can go really big in a matter of seconds. As always you can choose your size from a broad range of modular components. We recommend our MAGNUM system when heights above 3m is required - the width is optional. Here an example of a W300xH400cm MAGNUM display. 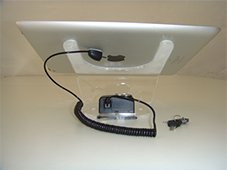 A smart tablet holder with alarm and anti slip surface for the tablet/Ipod. The acrylic display can be mounted on a table with 3M “extra strong” double adhesive or with screws. 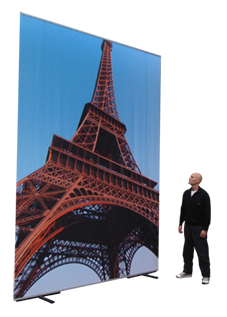 Portable Flag-extender™is an indoor/outdoor-advertising tool that will increase your visibility and attract attention. The Patented design of the Flag-Extender ensures that your message is always visible. This cross between a flag, sign and a banner is made with high-quality materials and the modular lightweight units are easy to set up/take down. 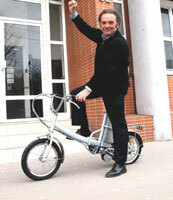 Here is the happy winner of our lottery for a foldable electric bicycle. Philippe Gstalder from APPUI - Image in France presents the swift street racer. We thank you all for the feedback you have given us. Come see us at Euroshop Düsseldorf '08! Tech View will be at Euroshop 'The Global Retail Trade Fair', in Düsseldorf Germany, on February 23-27, and we look forward to meeting you there. Come see us and get plenty of inspiration for your next projects - exhibitions, POP material and other marketing activities. Lumaline™ counter products won SGIA Product of the Year Award in the Finishing Category. It was judged by a panel of industry judges as the most important product to the digital industry, among the submitted entries. Our new product Lumaline™ has been very well received and we are proud to announce that we have been awarded with a diploma and medal in the FESPA Digital Print Award, Europe 2007 competition. This is a new version of FLEX-display™, which frames the banner. The display looks balanced and elegant with telescopic poles on two sides of the banner. It was developed especially for double-sided and see-through banners – but also looks great with regular banners. FLEX-display™ Frame is available in two versions: On a lightweight foldable base or on an elegant plate base. Both versions come in two sizes, and you can vary the banner height from 135-250	cm. The banner is mounted using a sleeve and a wire. 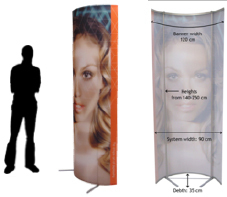 The telescopic poles ensure that the banner is always smooth and presented optimally. Click here to see our assembly instructions as a pdf-file. Or see a video of the system by clicking here. Please contact us if you have questions regarding the FLEX-display™ Frame system or if you are interested in a demo system - we will be pleased to assist you. Tech View will be exhibiting at SGIA'06 at the Las Vegas Convention Center in Las Vegas, September 26-29. You are welcome to visit us at booth number 3646 - more news about our participation to come soon! Tech View will be exhibiting at Visual Communication Europe in Paris, September 20-22. More news about the show to come! Visit us at FESPA Digital Europe! Tech View will participate at the FESPA Digital Europe in Amsterdam, May 16-18, 2006. We look forward to meeting our customers and to show our wide product range. Take the opportunity to come by our stand, see our products and test them. 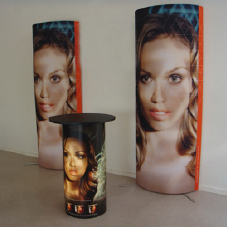 In addition to the FLEX-display™ product range we will bring examples of printed banners for inspiration and information. Please feel free to contact us to make an appointment for a personal product presentation during the show. You will find us at stand no. E975. The introduction of the 3-sided and 4-sided TOTEMS - as standing or hanging systems - adds exciting new applications to the FLEX-display product range.